Jacob Coxey was born in 1854. After a brief schooling he became a millworker at fifteen. He eventually became a successful quarry and foundry owner but always retained a concern for the poor. In 1891 Coxey established the God Roads Association and began his campaign for a national system of good public roads. He argued that the scheme would reduce unemployment and force private industry to raise wages. In 1894 Coxey organized a march of unemployed men on Washington. 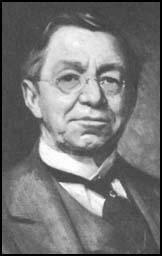 Coxey was active in politics and was a member of the Greenback-Labor Party before joined the Farmer-Labor Party. In the 1924 presidential election Coxey supported Robert La Follette and the Progressive Party. In 1931 Coxey was elected mayor of Massillon and the following year was selected to be the Farmer-Labor Party's candidate for president. He won only 7,309 votes and was easily defeated by Franklin D. Roosevelt. Later Coxey claimed that the public work schemes he had advocated during the election had influenced Roosevelt's ideas for a New Deal. Coxey continued to be active in politics and in 1946 he published a new plan to avoid unemployment and future wars. Jacob Coxey died in 1951.